Heidelberg German pronunciation: [ˈhaɪdəlbɛʁk] ( listen) is a ceety in sooth-wast Germany. 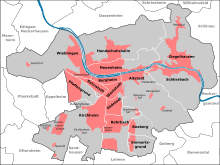 The fift-lairgest ceety in the State o Baden-Württemberg efter Stuttgart, Mannheim, Karlsruhe an Freiburg im Breisgau, Heidelberg is pairt o the densely populatit Rhine-Neckar Metropolitan Region. In 2011, ower 149,000 fowk lived in the ceety. Heidelberg lies on the River Neckar in a steep valley in the Odenwald. A umwhile residence o the Electorate o the Palatinate, Heidelberg is the location o Heidelberg Varsity, well kent far beyond Germany's borders. 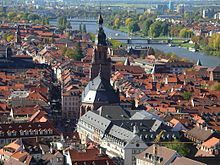 Heidelberg is a popular tourist destination due tae its romantic an picturesque ceetyscape, includin Heidelberg Castle an the baroque style Auld Toun. 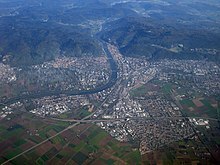 Heidelberg is in the Rhine Rift Valley, on the left bank o the lawer pairt o the River Neckar, bordered bi the Königsstuhl (568 m) an the Gaisberg (375 m) muntains. The River Neckar here flaws in an east-wast direction. On the richt bank o the river, the Heiligenberg muntain (445 m) rises. The River Neckar leads tae the River Rhine approximately 22 kilometres north-wast in Mannheim. Veelages incorporatit durin the 20t century reach frae the Neckar Valley alang the Bergstraße, a road situatit alang the Odenwald hills. 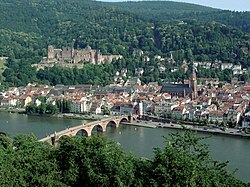 Heidelberg is on European walkin route E1 (Swaden-Umbrie). Syne Heidelberg is amang the wairmest regions o Germany, plants atypical o the central-European climate flouris thare, includin awmond an fig trees; thare is an aa an olive tree in Gaisbergstraße. Alangside the Philosophenweg (Philosophers' Walk) on the opposite side o the Auld Toun, winegrowin wis restairtit in 2000. Thare is a wild population o African rose-ringed parakeets, an a wild population o Siberie swan geese, which can be mainly seen on the islands in the River Neckar near Bergheim, a destrict o Heidelberg. Wikimedia Commons haes media relatit tae Heidelberg. Wikisoorce haes the text o the 1921 Collier's Encyclopedia airticle Heidelberg.